Canali di Marte creati dalla lava e non dall'acqua! ScienceDaily (Mar. 7, 2010) — Flowing lava can carve or build paths very much like the riverbeds and canyons etched by water, and this probably explains at least one of the meandering channels on the surface of Mars. These results were presented on March 4, 2010 at the 41st Lunar and Planetary Science Conference by Jacob Bleacher at NASA's Goddard Space Flight Center, Greenbelt, Md. Whether channels on Mars were formed by water or by lava has been debated for years, and the outcome is thought to influence the likelihood of finding life there. 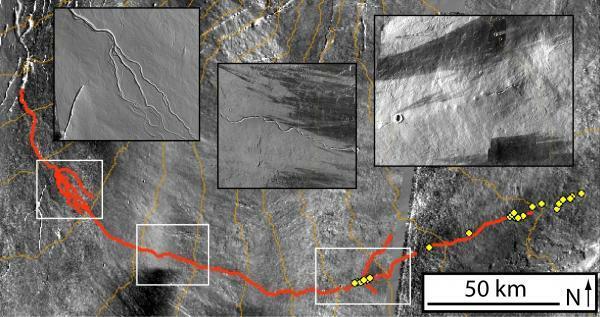 Flowing lava can carve or build paths very much like the riverbeds and canyons etched by water, and this probably explains at least one of the meandering channels on the surface of Mars. These results were presented on March 4, 2010 at the 41st Lunar and Planetary Science Conference by Jacob Bleacher at NASA’s Goddard Space Flight Center, Greenbelt, Md. Whether channels on Mars were formed by water or by lava has been debated for years, and the outcome is thought to influence the likelihood of finding life there.